As of 10 p.m., Ompong is expected to make landfall at Cagayan-Isabela on Saturday morning. MANILA, Philippines — Signal No. 2 has been raised in Isabela as the 900km-wide Typhoon "Ompong" (international name: Mangkhut) begins to make its wrath felt in northern Luzon Thursday night. State weather bureau PAGASA said Ompong continues to threaten northern Luzon as it moves westward at a slightly slower pace of 20 kilometers per hour and still packing maximum sustained winds of 205 kilometers per hour near the center and gustiness of up to 255 kilometers per hour. The center of Ompong was estimated to be 485 km East of Northeast of Virac, Cantanduanes. During their earlier briefing, PAGASA said that for Tropical Storm Ondoy in 2009, the observed rainfall within 24 hours in Quezon City was 455 mm while for Ompong, the predicted rainfall in Baguio will be 550.9 mm. 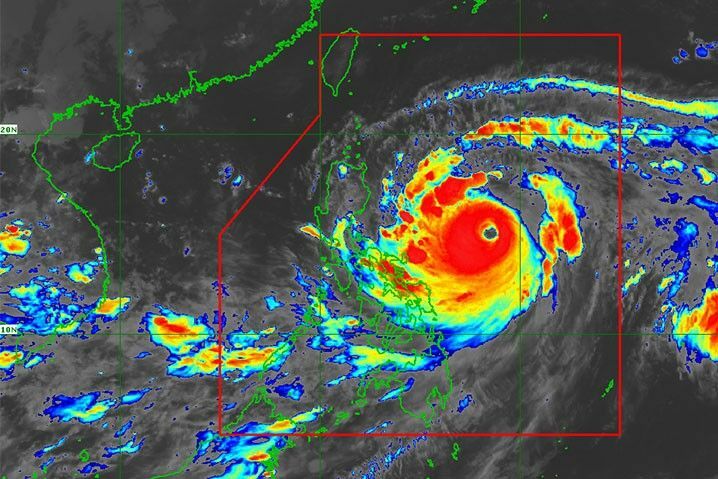 Typhoon Mangkhut is feared to gain strength as it approaches the Philippine area of responsibility. The tropical cyclone will be named "Ompong" once within the country's vicinity. The United States Navy's Joint Typhoon Warning Center records that "Mangkhut" has maximum sustained winds of 80 knots or 148 kilometers per hour and gusts of up to 185 kilometers per hour as of Monday morning. Forecast track of the cyclone shows that it is heading toward the northernmost tip of the country's water off northern Luzon by Friday. The Department of the Interior and Local Government tallies 66 dead, 62 missing in wake of Typhoon Ompong, ONE News reports. The department says it will also look into potential lapses in local governments' disaster preparations. The United Church of Christ in the Philippines clarifies Tuesday that a church reported to have collapsed in a landslide in Itogon, Benguet was an old bunkhouse that was being used as a place of worship by United Church Fellowship (Pentecostal Group). The casualty figure on Monday was at 56 dead but the figure is expected to rise, with around 40 to 50 people believed to still be buried in the mud as search and retrieval operations continue. Presidential spokesman Harry Roque, who said he is a member of UCCP, on Monday played down President Rodrgo Duterte's remark over the weekend that the "church" would not have collapsed if people had replaced the priest there. He also said priests are stupid. "Ang tingin ko naman po, hindi naman po seryoso ang presidente. Let's not take his words always literally," Roque said. Benguet was one of the areas hardest hit by Typhoon Ompong (Mangkhut) over the weekend. A Philippine national police report said the death toll as of Monday midday was 65, with 43 people missing and 64 injured. Chinese authorities reported four deaths from falling trees and building materials in Guangdong, China's manufacturing hub. The storm was still affecting southern China's coast and the provinces of Guangdong, Guangxi and Hainan on Monday morning and rain and strong winds were expected to continue through Tuesday. Hong Kong residents were being told to stay away from the coastline and be on alert for occasional gales. Bus, ferry and rail services were suspended and almost 900 flights were canceled at the city's airport, one of the world's busiest. The South China Morning Post said Hong Kong's hospitals had to use backup power due to outages caused by the storm. Australia is providing A$800,000 (P30.9 million) worth of humanitarian supplies to the Philippines in the aftermath of Typhoon Ompong. This includes sleeping mats, blankets and hygiene and shelter kits for up to 25,000 people in the most affected areas. These supplies are being distributed by the Philippine Red Cross. Australia also deployed humanitarian experts to the Philippines. "Our Embassy is coordinating closely with Philippine authorities and our international partners... We stand ready to provide further assistance, if requested by the Philippine Government," the Australian government says.